Earn $1.91 in Podium Club credit (191 points)What's This? 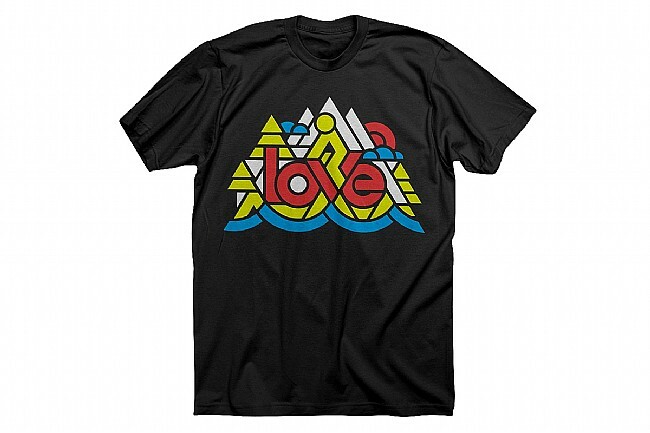 For all-day comfort, the Women's Bike Love T-Shirt from Twin Six features a relaxed fit, short sleeves, and crew neck collar, constructed of a soft, breathable, poly-cotton blend fabric. The colorful, screen-printed, geometric design up against a charcoal black base color pops with style. Stylish, colorful, screen printed design. Soft, breathable, comfortable poly-cotton construction. Crew neck & short sleeves. Chest 0" 30"-32" 32"-34" 36"-38" 40"-42" 0"
The shirt is pretty a little thin but fits nicely and I like the design. I am 130lbs and 5'8 and got a medium. It is a loose fit, which I like. A small would have also worked but been more fitted.